It's obvious the threat that the red forest poses in 2044. Jones is completely at a loss of how to deal with this but not to worry, Eckland is full of snark for her morose behaviour. While the scenes between these two are brief, it's clear that their unconventional romance works for the both of them and more importantly keeps her on track, even if Jones continues to be in denial about their connection. I very much love the fact that Eckland seems to enjoy shocking Jones. With the threat of the end of time looming, it's time to go and visit everyone's favourite disturbed woman, Jennifer Goines. Jennifer is willing to see Cole but instructs Jones to wait outside. This is the first meeting for Cole and Jennifer in 2044 and he's clearly shocked by her advanced age. Even though Cole travels through time, his life is lived in a series of days and so for him, it's only been a few days since seeing the young Jennifer while for Jennifer, it's been years. Cole naturally wants to know about the Primes but Jennifer says that she doesn't see things the way that she used to and so to get the information they need, Jennifer says that they must go back to 2016. Back at the compound Cole relays Jennifer's message and then drops the hammer saying that Jennifer said that Cassie is the one who has to go back. There's been a lot of bad blood between Ramse and Cassie but the one thing they can agree upon is their mutual dislike of Jennifer. It's actually hilarious to watch as they both team up against Cole regarding their feelings about Jennifer. So, Cassie heads to the splitter machine and as she is waiting to shift, there's some competitive juvenile tension between Deacon and Cole as they say goodbye to Cassie. I know that this was meant to seem cute but I found it seriously irritating. So, back to 2016 where Jennifer is now doing well in therapy, taking her meds and doing it all to an updated version of the Mary Tyler Moore theme. Yeah, I actually loved the music choice here and it so suited Jennifer's journey to get real treatment for her mental health issues now that she is free of her father's controlling behaviour. I like this version of Jennifer a lot. When Cassie catches up with Jennifer however, she has no respect for what Jennifer is trying to accomplish and instead sets about attempting to trigger Jennifer to get the information she wants on a primary. This is part the new cold Cassie persona and I simply cannot stand it. A Doctor's first vow is to do no harm and Cassie is so removed from this vow that she is willing to sacrifice Jennifer's new hard won stability for her end game. Back in 2044, only one man from a five man scout crew returns. Deacon is immediately suspicious and believes that he has been sold out. When in frustration the guilty party blames Deacon for the situation that the 7 find themselves in, Deacon responds by shooting him in the head, much to the horror of Ramse. Ramse is back in the role of playing the moral guide but he doesn't wear it as well this time around given his role in releasing the virus to save his son and Deacon never tires of letting him know this. Both Cole and Ramse are certain that Deacon is more trouble than he is worth and worry about how vulnerable he actually makes them. After not being able to get Katrina completely onside, Cole and Ramse decide to take Deacon on a road trip which ends with them handing Deacon over to his enemy the Foreman. Back in 2016, we learn a lot about Jennifer's haunted past. Her mother tried to drown her and was also mentally ill but not a Primary. Jennifer constantly sees visions of her mother. In her childhood room, Jennifer shows Cassie the multiple drawings that she has made. It all goes a long way to humanising Jennifer, not only for the audience but for Cassie as well. It shouldn't have taken the revelation of Jennifer's darkest secrets for this to have happened though. The casualness with which Cassie sought to trigger Jennifer was absolutely appalling. The relationship between Cassie and Jennifer gets another boost when Cassie is taken hostage by the 12 Monkeys and placed in the tub of travel by Olivia. It's worth noting that Olivia is starting to have some doubts because of the uncharted territory they are in but that doesn't stop her from getting to work on Cassie. Cassie is sent walking to the red field towards the Witness and the broken down house. What the hell is up with the house? It was featured three times and so obviously has some sort of significance. I love the fact that the Witness answers questions by having them appear on the walls of the house, ratcheting up the creep factor. At any rate, it's Goines to the rescue and it's awesome. In her effort to save Cassie, Jennifer comes across a parchment of sorts filled with pronouncements from the Witness. Yeah, you know you paused the show to have a really good look at it. What jumped out to me immediately were the words, "These arms of Mine", which obviously has to do with Cole and Cassie. Hmmm. Even more importantly it has the date of Jennifer's death. Jennifer manages to get Cassie out of the tub from hell but they are confronted by Olivia who seeks to control Jennifer in her role as surrogate mother. Unfortunately for Olivia, Jennifer isn't the same fragile young woman she originally met. Jennifer takes out Olivia and this works out just fine for the Pallid Man. Though he has seen the inconsistencies, unlike Olivia he is still very much a true believer. He makes his own little trip to visit the witness, and is put in charge. It's worth noting that while Jennifer stabbed Olivia, we don't know if she's dead or simply badly injured. I wouldn't necessarily count her out. Back in 2044, Deacon shows up bloodied but clearly alive much to the shock of Ramse and Cole. Despite taking a beating, he's actually proud of Ramse and Cole for doing what he what have done. Their action also allowed him to take revenge on the man who killed his brother. Deacon decides that it's all water under the bridge and that his men are not be be informed about what happened. Deacon simply asks Cole to bring him back some whiskey on his next mission. When Cassie and Cole do meet up again, Cassie actually decides to stay in 2016 while Cole goes back to the 70's to hunt down the other prime. Cassie it seems wants to spend time with Jennifer; however, she does remind Cole that the Prime they are looking for is very dangerous and that he should be wary. Cole pauses at the bar to grab a bottle for Deacon and tells Cassie that she can still tell him anything. Considering that life is easier in 2016, I wonder if this mark a return of the Cassie we met in season one. There were a lot of moving pieces to this episode. I've been complaining for some time about not knowing this identity of the witness and I was happy to see some sort of hint. Could the witness possibly be Aaron? Did he actually survive the explosion and if so, what are his motives for wanting to end time? I loved looking at the Witness parchment and I want a closer look. I am still waiting to see how the virus connects with the whole ending time thing. It feels as though the effort to stop the virus has just been put on hold. Yes, ending time as we know it is a bigger threat but I think that a connection must still be made. Right now, the meta just feels completely disjointed because there is no link between the virus and the whole red forest end of time problem. Jennifer continues to be an interesting character and while her arc has been quite tragic, I loved seeing this incarnation of her. It's obviously the root of the woman she is in 2044. I love the idea of her taking control of her mental health and being active rather than passive. I love the snark she never fails to deliver as well. I think that Jennifer is an extremely interesting portrayal of mental illness and can think of no character quite like her on another television show. The one thing I want more of is Jones and Eckland. Sure, it could be seen as a distraction from the meta but I find that I am enjoying watching their unconventional romance growing. 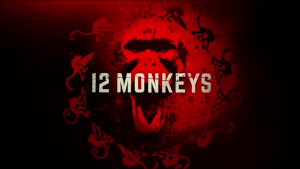 Because 12 Monkeys can sometimes be so dark, it really adds a much needed level of lightness.